I haven’t talked about it much on this blog so far, but one of my sporadic hobbies is designing clothing – particularly fantasy costumes. Now, these rarely ever make it off the paper to be turned into an actual garment (mostly because of financial restrictions – fabric is expensive, y’all) but knowing what my characters wear helps me to tell a story more accurately. My mother taught me to sew when I was young, when I was about six or seven. Even though it’s a skill I don’t use as frequently as I would like (because fabric is expensive) it’s definitely a skill I didn’t expect to be as useful to writing as it has been. Learning to sew has taught me the importance of fabric choice (cotton is not appropriate for all garments or climates, or even time periods), and technique (even cutting the pattern a certain way on the fabric can have an effect on the final shape and strength of a garment), especially in relation to the characters I write. 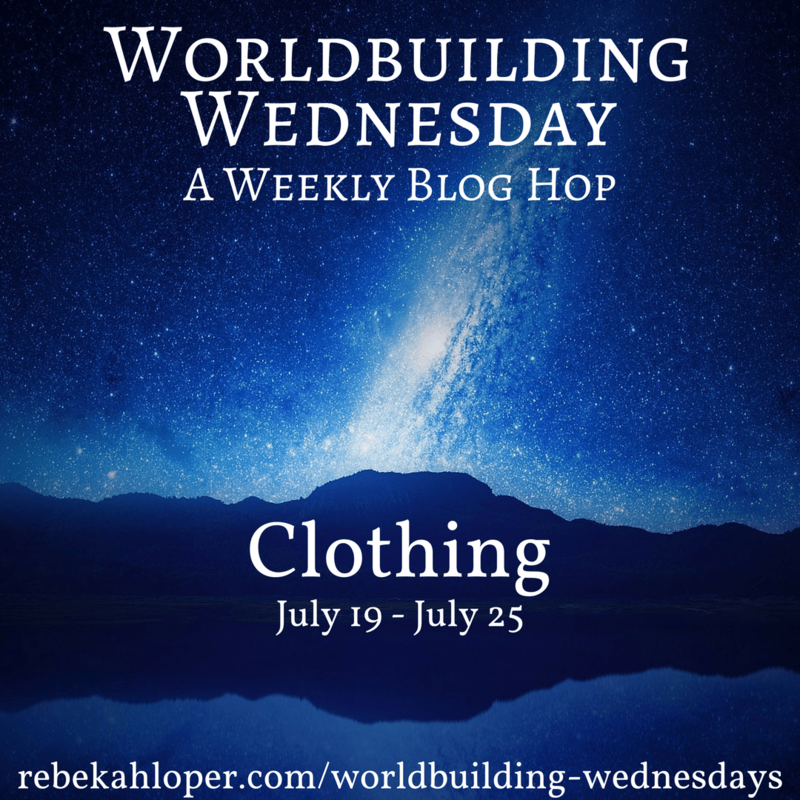 You might like this post, too: Announcing the Worldbuilding Wednesday Re-launch! There are two things I recommend for anyone who wants to do more than basic descriptions of clothing and fabrics. Learn your terminology – both for different parts of garments, and for fabric. Observe clothing – how it drapes and moves on bodies, especially in relation to what it is made from. You don’t have to get technical in your descriptions and designs of clothing for your characters, but you must get terminology correct when it counts – especially if you’re designing a garment based off of a historical piece. If you put someone in a sheath dress, when it should really be a princess dress, the silhouette your reader imagines will be completely wrong. People watch. But watch their clothing – how it moves and shifts with them (or not), and what is flattering or not based on cut and drape and body shape. Also watch how people act about their clothing in different climates – are they obviously too hot or too cold, and how does it compare to what other people are wearing around them? If you want to do more than just imagine your character’s clothing, or find the closest thing you can on Pinterest, you’ll need to draw it. What is the day-to-day life of your character like? Do they have to take the climate and terrain into consideration for how they dress? Do they have someone to help them get dressed, or is it all up to them? What textiles does your character have access to, taking both income and location into consideration? What can be made and found locally? I would love to see your character’s costumes! Draw up a quick sketch, or put together a Pinterest board for inspiration, making note of which elements you want to incorporate. Then write your response post and share it in the link list below, and don’t forget any questions you have! Please review the rules and guidelines for Worldbuilding Wednesday before participating. Thank you! I actually know how to sew, which makes the clothing aspect of worldbuilding more interesting. My current WIP Revenant Nation is set in near-future, but much of it is among dissident groups in rural areas where the women, at least, wear different, modest clothing styles based on Amish, pioneer, and European peasant clothing. I joined up for the blog hop and I think writing about the clothing in my world helped me. I had these things in my head but hadn’t written them down yet.